Lapointe, Pierre Louis and Claire Poitras. "Repentigny". The Canadian Encyclopedia, 04 March 2015, Historica Canada. https://www.thecanadianencyclopedia.ca/en/article/repentigny. Accessed 24 April 2019. Repentigny dates back to 1647 when Pierre Legardeur de Repentigny was granted a seigneury, but settlement did not occur until after 1670 when his son Jean-Baptiste was given the seigneury. Repentigny, Qué, City, pop 72 218 (based on the 2001c), 53 824 (1996c), 49 630 (1991c), area 61.77 km2, was created on 1 June 2002 by the amalgamation of the former cities of Repentigny (incorporated 1957) and LE GARDEUR. Repentigny is located 24 km northeast of MONTRÉAL where the Rivière L'Assomption and Rivière des Prairies meet the St Lawrence River. It is built on a quasi-peninsula formed by the Rivière L'Assomption and the St Lawrence, fronted by a chain of islands along its shoreline. 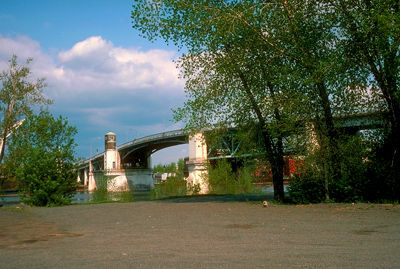 The city is connected to Île de Montréal by the Pierre-Le-Gardeur Bridge (1938-39 and rebuilt in 1974). Repentigny dates back to 1647 when Pierre Legardeur de Repentigny was granted a seigneury, but settlement did not occur until after 1670 when his son Jean-Baptiste was given the seigneury. The area was set up as the parish municipality of Notre-Dame-de-l'Assomption-de-Repentigny in 1855 and the name shortened in 1956. For most of Repentigny's existence, growth was rather slow. It numbered 106 inhabitants in 1681 and a mere 650 in 1925. From 1920 to 1960, it became known as &QUOT;Repentigny-les-Bains&QUOT; because of its fine beaches, cottages and summer resort activities. After 1960, when it had a population of just 9000, it became one of the fastest-growing suburbs of the Montréal metropolitan area. &QUOT;Westmount-de-l'Est,&QUOT; as it was then nicknamed, attracted the well-to-do and, in a sense, continues to do so. The doorway to the Lanaudière region of Québec, Repentigny is the most important municipality of the regional county municipality of L'Assomption. Although primarily residential in character, this mainly French-speaking city (97%) does have some manufacturing. Nearby is Parc d'Île Lebel, a 34 ha haven of peace and quiet. Parc Saint-Laurent, within the city, has a boat ramp and hosts a number of cultural and sporting events each year. A landmark is the Roman Catholic church, La Purification (1723-25). Fromagerie champêtre is a family-run cheddar cheese factory.